I think they must hate him. Ezra is ok. My kids have unique names so I'm cool with it, but Stegosaurus? We thought she was joking for about a month. Then, when I realized I would be making this child lots of handmade items, I needed to know his real name so I would have his initials correct--because, surely, Stegosaurus wasn't his real middle name! How wrong I was! My mother-in-law is so embarrassed that she has yet to tell anyone what the child's middle name will be. Can you imagine applying for college, a credit card, a passport, your SATs with the middle name Stegosaurus? People are never going to believe him! It'll be cool when he's 5, but when he's 25, he's going to disown his parents! We're taking bets as to whether he will change his middle name completely or just go by "S." Anyway! I was going to make her a quilt (duh) and I asked her if she had any preferences. She asked if I could applique stegosauruses--is that a word?--all over the quilt. Do you all know what a stegosaurus looks like? All those spikes? Is she crazy? I decided I would applique ONE stegosaurus. Any more than that and I'd be turned off applique for life! I went with a very simple design selected by my hubby, wonky 9 patch. Quilt stats: 9 fat quarters cut into 18" squares. Blocks finish at 16" once you make the wonky 9 patch. Naming a child is probably one of the most important decisions for a parent because the child's name is initially how the world will 'see' the child. So, it's disheartening for me to hear that they are putting their son at such a huge disadvantage with his choice of middle name. I guess some people think it's cool. The quilt, thought is precious and I love the fabric choices. I love the look of wonky. It's still not the worst middle name I've heard. A friend of mine is an aunt to Sophie Spaceghost. I totally get preferring simple patterns that show of the fabric. Almost all of my quilts get made in less than a week. cute cute quilt kelly! does your SIL read this blog I wonder? Early April Fools?!?!? 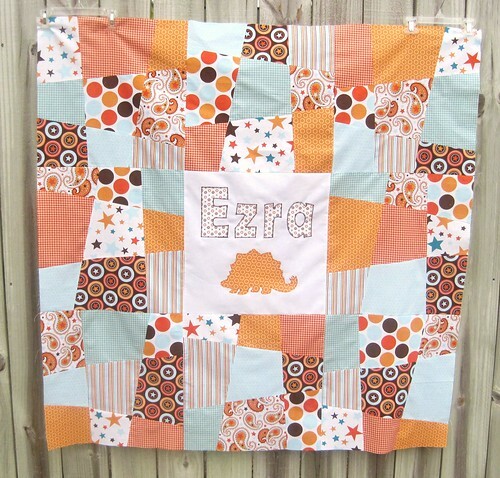 I love the quilt and the dino applique is lovely for a boy, regardless of middle name. This reminds me of when my son was 4 and I was pregnant with my daughter. We ask him what he might like to name his new little sister and he quickly replied," Traffic!" Followed by," That's a good name Mom. Dontcha think?" Forgot to say....I love the quilt! The colors are great and so is the pattern. Well done on the applique for both his first and middle :-) name too! love that quilt...and i can relate to baby name drama. it's a VERY long story, but my niece's first and middle names are Jessica F.E. - her middle name is initials! and the story behind it is full of family drama. my mom is so embarrassed of it!! despite all of that, you did a great job with the quilt! That's really cute! I love the dinosaur! Don't feel lazy for easy piecing. Do what you like to do, and the fabric looks great! Well first of all I saw this pic on flickr with no explanation and my initial response was aww cute dino. And now I don't know what to think :) I mean the dinosaur is still cute and all but wow! I do know that I can NEVER EVER EVER tell my boyfriend this. Because he will think it is the coolest thing ever. But he would argue they should of picked a cooler dinosaur like the t-rex and if we go down that road ever we will have a child with the middle name tyrannosaurus. Yeah I'll only ever tell him this if we break up just to punish the next lady in his life. Kidding... maybe... I'm terrible. I can't believe they are both in agreement on this. Maybe they will get so much grief before baby Ezra meets the world and rethink it and then your blanket can just be a cute little inside joke. But back to the quilt I love how you used the all-star fabrics in this layout. With so many patterns this block style it breaks them up nicely. I love the colors too. i'm so confused that i can't even think of a clever comment. is one of them a paleontologist (or however you spell it)? I am a NICU nurse and to be honest, have heard of some pretty "interesting" names as well. But wow, there are no words for the poor boy. I'm even more curious as to the names of future children!!! But the quilt is adorable. OMG, I'm so sorry. At least it's only his middle name and not his first name. And sigh - why do people keep picking long names, it's so hard to personalize stuff right? Love the little dinosaur though, the quilt is very cute! those are the funniest names i have ever heard...here i was worried about my daughters initials being a curse word(DAM)....stegosaurus is way worse! If I tell my husband about this he will be insanely jealous and want to name our kids after dinosaurs. When we got married he almost changed his middle name to "Danger". Well I think that you did a lovely job on the quilt given the circumstances. that is the best possible interpretation of this name. So good for you! Maybe when they see him for the first time they won't like that anymore. You can hope! But at least it is his middle name. Did someone lose a bet? Adorable quilt!! Sad about the name. Seems pretty selfish and egotistical on the part of the parents. I'm sure they will love him and all that, but why burden him with such a silly and cumbersome middle name. I have a long last name, but at least it's a name and not a noun. Love the quilt :) So dang cute as usual, you are the best quilter I know. The quilt is insanely adorable!!! When I saw it on Flickr I thought awwww!! Now though I feel awful for the kid. I mean aren't the parents thinking ahead to when this kid is older than 5. I mean will anyone ever vote for a man with Stegosaurus as a middle name for President? Even just going to DMV is going to be horrifying experience for this poor kiddo. I would definitely change my name legally! Holy smokes!! lolololololol I didn't see this until now (posted while I was out of town) OH, my. Scott's shared some doozies that he's run into at the hospital, and this is not the worst - middle name of Stegosaurus is much better than first name of Latrina. I actually love the middle name, the school kids are going to be so jealous!! As someone with a unique name, it's actually turned out to be a good thing in my life.